My latest painting, of this Beautiful Belgian Girl. Resting in the Glow of the Sun. Original oils on stretched canvas. 9″ x 12″ this painting is available $275.00 plus shipping to your area. 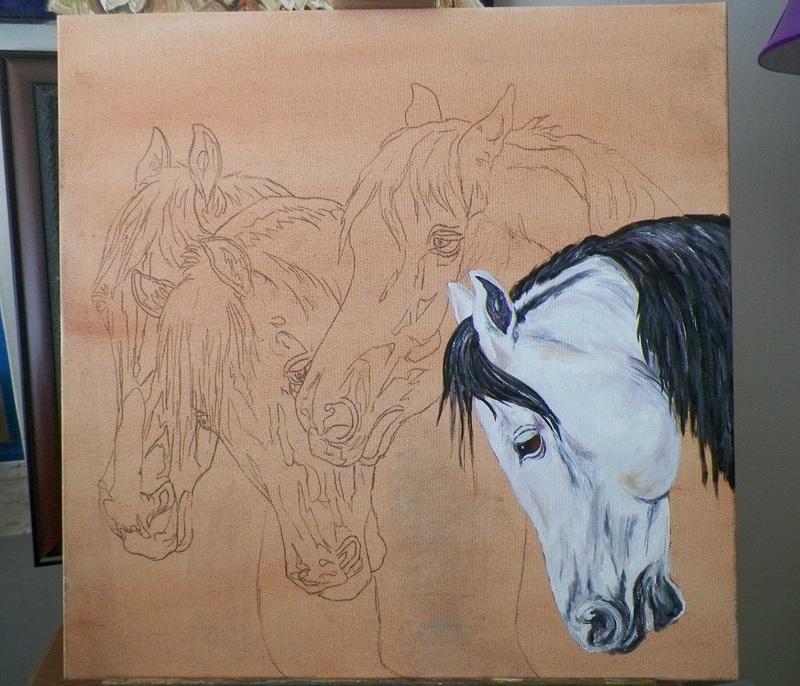 I would enjoy hearing Your comments on this Just finished painting……. ” Martha Nappn” ” This painting is in oils, striking in person. It is “just” now finished. Such a Beautiful moment. 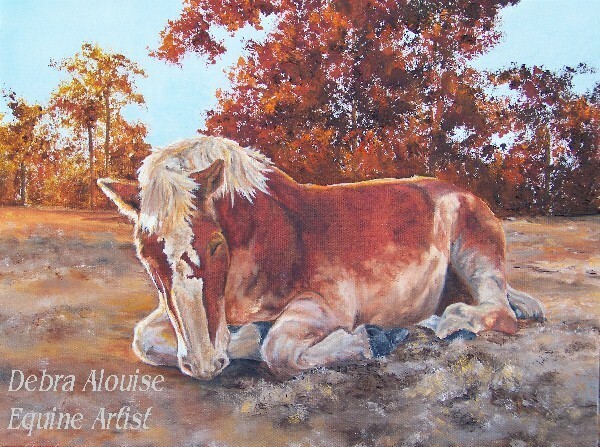 This Big Belgian, “Martha” a Belgian horse taking a nap. Resting gently, so sweet. I Love this moment. 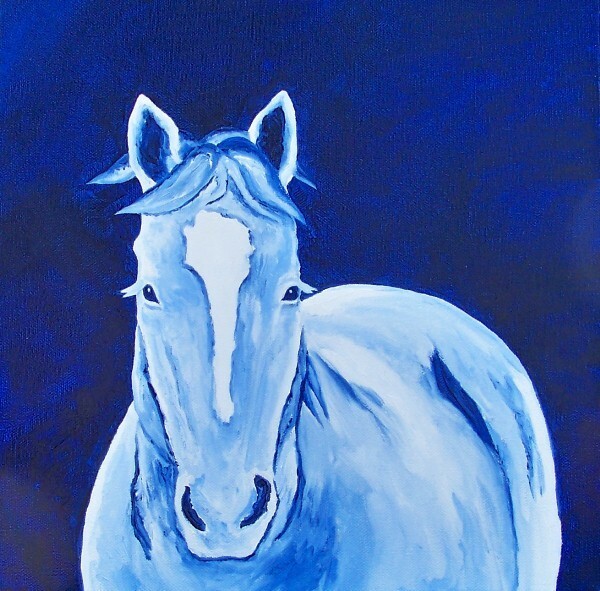 I also just finished this ” Winter Snow Horse” since it is Winter I wanted to paint a horse with a Winter Snowy feel. Oils on 12″ x stretched canvas. Available for $95.00 plus shipping to your area. Sides are painted matching Midnight blue so you may hand un-framed or framed. Original Oil paintings on stretched canvas. Above painting is 10″ x 10″ oils on stretched canvas. Sides painted to hand un-framed or framed. Available for 75.00 plus 12.00 shipping. Packaged well to arrive safely. Above painting is oils on stretched canvas. This horse ventured out into these vast Mountains with their owner. Titled, “I’m going Where” 9″ x 12″ available for 95.00 plus 12.00 shipping. This is part of my 2 painting Set. Titled “Optimistic Storm Cloud” even though a Storm arrived the Blue Optimistic Sky peeks thru, to show a nicer day will arrive. Both painting are Oils on stretched canvas, 8″ x 10″ The Set is available for 150.00 The landscape was a wonderful workshop study painting. “Crossing the Creek” Original Oil painting on stretched canvas. This horse and the below white horse, are on the same Beautiful Trail Ride out on the East Coast. I painted both of these painting in Impressionist Style with a pallette knife. Oils on Stretched Canvas 8″ x 10″ sides painted so you may hang un-framed or framed. Sides are painted to carry on from the front coloring. Close up of the Horse in the painting above photograph. Painted Impressionist style with a pallette knife. Thick & chunky paint. Impasto oils on stretched canvas. I LOVE these! I have just finished them. More from my “Horse Gets in My Way” Landscape Original Oil painting with horses passing by, lounging around and looking right at You. These are 9″ x 12″ paintings. 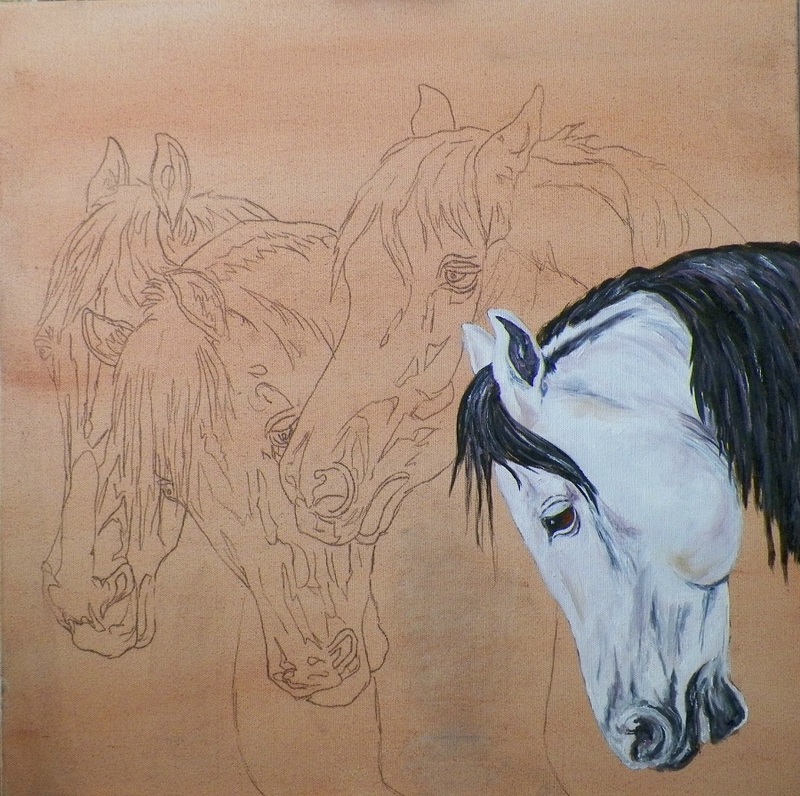 I am selling the Originals, however and also going to have them made up in Giclee fine Art prints on canvas. 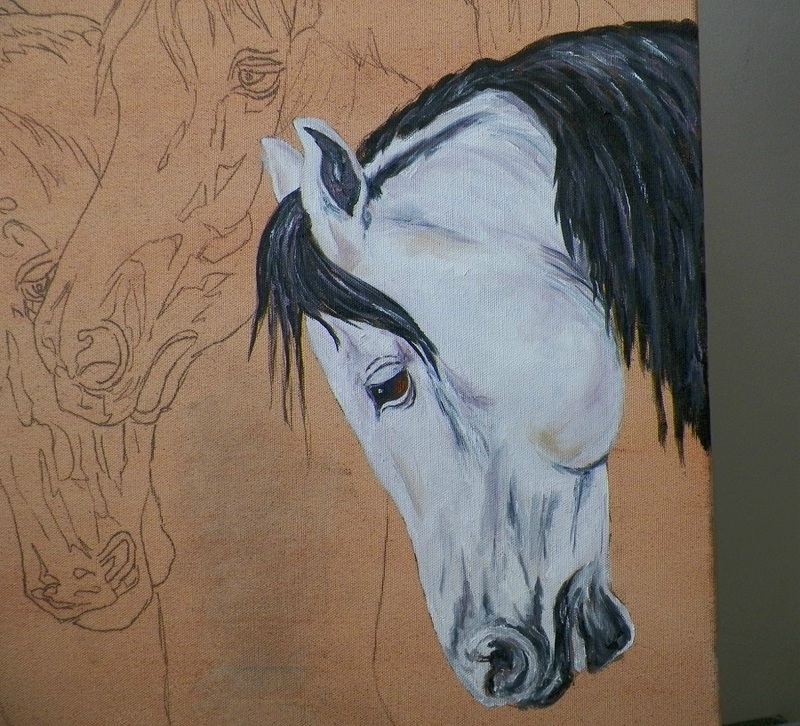 Leopard Appaloosa walking thru my Painting. This is an Original in oils 9″ x 12″ on stretched canvas. This painting is also for sale and will be offered in Giclee fine Art prints on canvas.